With all votes counted and the totals certified this week, 71.83 percent of registered voters returned ballots for the Nov. 6 general election. That was two hundredths of a percentage point below the midterm high mark of 71.85 percent set in 1970. Washington’s 2018 voter turnout fell just a smidgen short of setting a midterm record. “I’m very happy that we have such great engagement from our voters,” Secretary of State Kim Wyman said Wednesday, noting the state had missed setting a record by just 1,101 voters. The 2018 turnout did exceed the 2010 midterms, when it reached just over 71 percent. And it was far higher than the 54 percent turnout in the last midterm in 2014. Voter participation was highest in San Juan County, at nearly 84 percent, and lowest in Yakima County, at about 62 percent. In King County, turnout reached nearly 75 percent of registered voters. It was just under 71 percent in Snohomish County and just over 66 percent in Pierce County. Wyman attributed the comparatively robust voter interest this year to contested high-profile congressional races and statewide initiatives, some setting spending records — as well as the national political picture. “There were so many things going on. Certainly in the background, President Trump was on voters’ minds,” said Wyman, a Republican. A backlash against Trump and Republicans was apparent in Democratic gains here, including Kim Schrier’s defeat of Dino Rossi in the state’s 8th Congressional District, and expanded Democratic majorities in the state House and Senate. But Republicans fended off other scares, with Rep. Cathy McMorris Rodgers, R-Spokane, and Rep. Jamie Herrera Beutler, R-Vancouver, keeping their seats. Wyman said it’s unclear whether the state paying $1.2 million postage for ballots made a big difference. 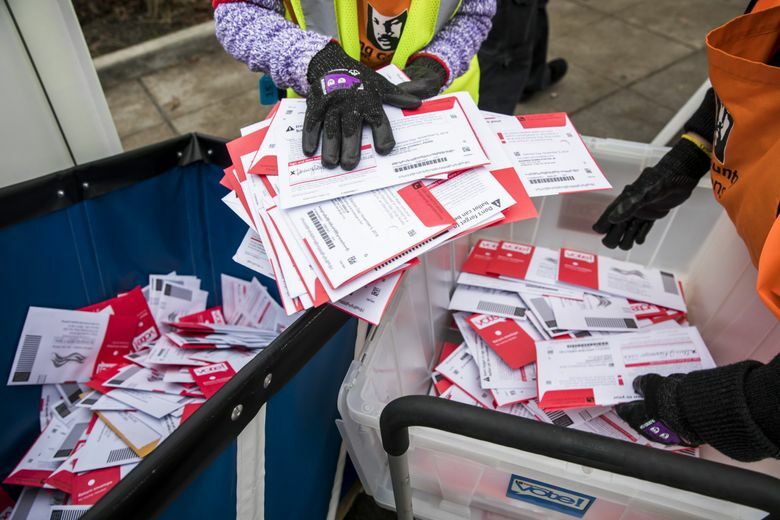 “I think it’s muddied waters,” she said, pointing to some evidence that the prepaid option just led more people to send ballots in the mail as opposed to finding drop boxes. Still, Wyman said her office heard comments that skewed five-to-one in favor of keeping the prepaid ballots — especially from young people who don’t use stamps. Given the popularity, she said her staff is working with Gov. Jay Inslee’s office to fund prepaid ballots in the 2019-21 state budget.